Welcome to the testimonials page. Here we display the testimonials of all our happy clients. If you would like to leave your own testimonial, please use the contact us link to let us know what you think of our products and service. "I recently broke the handle on our Austral Foldaway Rotary (#51) clothes hoist and phoned Sunni for help. Richard happily made time to ensure I understood the mechanics of the hoist and its care. I opted to drive from Brisbane to buy the needed parts, and was grateful for Erica's clear and helpful directions. I experienced some problems after refitting the handle and again phoned for advice. Mike was there the next day and got the line functioning nicely again, free of charge. We must have been dealing with Sunni for about 20 years now. They genuinely care about their products and their customers, something few businesses do these days." - Howard, Forest Lake. "I would like to thank you very much for such wonderful service. It has been an absolute pleasure to deal with you. Dennis installed the Retractaway 40 clothesline early in the morning, he left the site clean and tidy and a great fellow to boot. It's such a rare thing these days for a company to wait for payment until after they supply and install, I appreciate the fact that you respect your customers enough to ensure they are happy with your product and installation before you take payment. 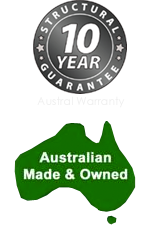 An Australian company selling and supplying Australian made products!!! I can't thank you enough for such wonderful service. I would, without hesitation recommend your company to others. Thank you again." - Deidre, Booval. "Just wanted to let you know that we successfully fixed the handle assembly on our foldaway 51 clothesline. It now winds up all the way FREELY and smoothly! Thanks so much for all your excellent guidance with this ... couldn't have done it without your detailed instructions. Warm regards." - Pauline and Jim Mathers, Bald Hills. "Order received and installed. Looks just great." - Karen, Wynnum West. "We have had our Austral line for over 15 years and it was still in good condition but as we were refurbishing and the cord needed replacing I decided to purchase a new one to suit the new colour scheme. The service given by Sunni with the ordering process, the pricing and the installation was simply impeccable with very friendly and efficient staff. Many thanks." - Geoff, Sinnamon Park. "Earlier this year I approached Sunni Letterboxes and Clotheslines seeking advice on my particular problem a high rise apartment with a narrow balcony and the need for a slim line, low profile clothesline. I was given courteous and informative service about the "Austral Slenderline 16 Clothesline" which was perfect for my needs and measured to fit the space I had available. I was surprised at how competitive the price was and when quoted for supply and installation, I agreed to take this suggestion. Ron the installer was prompt and professional. The line was basically installed in under 20mins and works perfectly. I was so impressed with this product for use in our apartment, that I have since ordered and installed another one in my rental apartment at South Brisbane. For the perfect slim line, low profile, fold down clothesline to suit balconies on apartments, I highly recommend the products and services from Sunni. Thank you." - Denise, Chermside Brisbane.